I'm so honored to be able to say that I've been accepted as an official blogger for We Do SL Events. This is such an honor and I'm so happy to be able to be part of the team, and amazing team which brought Fetish Fair and Black Fair, which will be starting on the 7th of this month, as well as many other amazing events. I have to say I'm super excited for this event as, if you noticed, I am absolutely in love with black (it doesn't count as a color, but it definitely is my favorite ever) and love to wear it. Even on hot summer days, black is still number one choice. 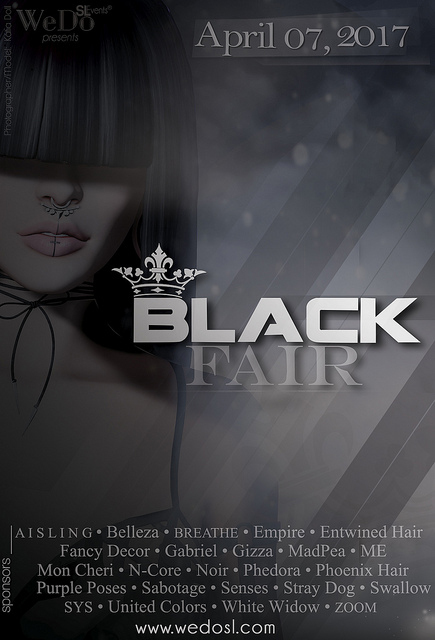 If you'd like more info on Black Fair, click here! 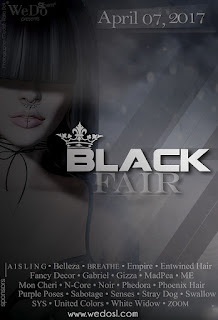 Excited for Black Fair? Here the lovely designers!